PARNEVU T-Tree Break Control coats the hair with its unique formula, preventing hair breakage and split ends. 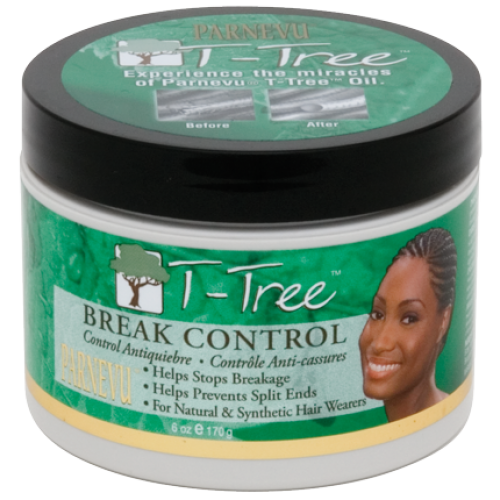 This process locks in moisture, adds elasticity, and leaves the hair soft, manageable, and shiny. INGREDIENTS: Water (Aqua, Eau), Propylene Glycol, Glycine Soja (Soybean) Oil, Glycerin, Cetyl Alcohol, Stearalkonium Chloride, Melaleuca Alternifolia (Tea Tree) Leaf Oil, Butyrospermum, Parkli (Shea Butter), Panthenol, Quatemium-92 and Diproplene Glycol, Lanolin Oil, Trimethylsilylamodimethicone, Hydroxypropyl Trimonium Honey, Hydrolyzed Collagen, Acrylates/C10-30 Alkyl Acrylate Crosspolymer, Benzophenone-4, Zea Mays (Corn) Oil and BHA and BHT, Triethanolamine, Fragrance (Parfum), DMDM Hydantoin, Methylparaben, Proplparaben, Yellow 6 (CI 15985), Red 33 (CI 17200).